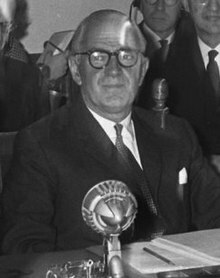 Robert Michael Maitland Stewart, Baron Stewart of Fulham, CH, PC (6 November 1906 – 13 March 1990) was a British Labour politician and Fabian Socialist who served twice as Foreign Secretary in the first cabinet of Harold Wilson. The son of Robert Wallace Stewart, author and lecturer, and Eva Stewart née Blaxley, Stewart was born in Bromley and educated at Brownhill Road Elementary School, Catford, Christ's Hospital and St. John's College, Oxford, where he graduated with a first class BA in Philosophy, Politics and Economics in 1929. While at university, Stewart was President of the Oxford Union, and of St John's Labour Club (1929). He began his career as an official in the Royal Household during 1931. He worked for a short period with the Secretariat of the League of Nations, before becoming a schoolmaster, first at the Merchant Taylors' School in London, then at Coopers' Company's School, Mile End, and then at Frome, Somerset. During World War II, Stewart served in the Middle East, joining the Intelligence Corps in 1942, before transferring to the Army Educational Corps in 1943. He was promoted to captain in 1944. On 26 July 1941 he married Mary Birkinshaw, later Baroness Stewart of Alvechurch; they had no children. They were one of the few couples who both held titles in their own right. Stewart had contested the Lewisham West constituency in 1931 and 1935, and Fulham East in 1936; after the war he became MP for Fulham East 1945–55, then for Fulham 1955–74, and Hammersmith, Fulham 1974–79. Soon after his initial election, he was made a junior whip, then a junior minister, as Under-Secretary of State for War (1947–51) and later as Parliamentary Secretary to the Ministry of Supply (May–October 1951). Following Labour's defeat in the 1951 election, Stewart was a rising figure on the shadow front bench, serving as Shadow Minister of Education (1955–59) and then as Shadow Minister of Housing and Local Government (1959–64). Stewart was Fabian Summer School Director in 1952 and Lecturer in 1954. He was Fabian New Year School lecturer in 1954–55 and Publicist in 1956. Stewart is listed as a member of the Fabian Society International Bureau Committee during 1957–58 and was mentioned in Fabian News Nov–Dec 1964 as a former member of the Fabian Executive Committee. When Harold Wilson became Prime Minister in 1964, Stewart was appointed Secretary of State for Education and Science. He was promoted to Secretary of State for Foreign Affairs in January 1965. He was described by the press as relatively unknown to the public but was extremely well known within Fabian Socialist circles. He became Secretary of State for Economic Affairs in 1966. From 1966 to 1968, he was First Secretary of State. He returned to the Foreign Office from 1968 to 1970. As foreign secretary, he was instrumental in supplying arms to support the Nigerian government's crushing of the secessionist movement in Biafra (when up to one million people died), later saying "It would have been quite easy for me to say: This is going to be difficult – let's cut off all connexion with the Nigerian Government. If I'd done that I should have known that I was encouraging in Africa the principle of tribal secession – with all the misery that could bring to Africa in the future." A committed pro-European, Stewart was Leader of the Labour Delegation to the Council of Europe in June 1970, and joint president of the Labour Committee for Europe with George Brown and Roy Jenkins. He served as a member of the European Parliament from 1975 to 1976. Stewart was made a member of the Privy Council in 1964. He was appointed a Companion of Honour (CH) in the 1969 New Year Honours. He retired from the House of Commons in 1979. Stewart was elevated to the House of Lords, being created a life peer with the title Baron Stewart of Fulham, of Fulham in Greater London on 5 July 1979. He died in 1990, aged 83. ^ Oxford University Calendar 1932, Oxford : Oxford University Press, 1932, p. 282. ^ Lane, A.T. (1995). Biographical dictionary of European labor leaders (Volume 2 ed.). Greenwood Press. p. 931. ISBN 0313299005. ^ "By Nigeria correspondent Barnaby Philips". BBC News. 13 January 2000. Archived from the original on 15 December 2013. Retrieved 16 May 2008. ^ "No. 44740". The London Gazette (Supplement). 1 January 1969. p. 24. ^ "No. 47900". The London Gazette. 10 July 1979. p. 8714.